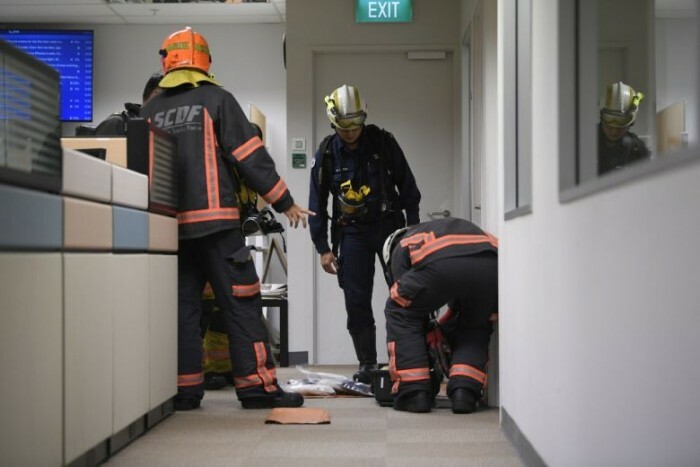 The police and Singapore Civil Defence Force (SCDF) were called in to The Straits Times' newsroom on Friday afternoon (Nov 2) after a suspicious letter was received. Three female employees said they felt dizzy after coming into contact with the letter, which had United Kingdom postage stamps on it. It was addressed to “The Straights Times” and contained several pages of content that was incoherent. The women described the letter as having a pungent, burning smell that left them feeling dizzy. Two also felt teary. Security officers at the Singapore Press Holdings (SPH) News Centre in Toa Payoh, where the newsroom is located, reported the matter to the police at about 4pm, who then alerted the SCDF, reports The Straits Times. In a statement posted on Facebook, the SCDF said they cordoned off the area and secured the envelope in a sealed container upon arrival. SCDF was alerted to a suspicious envelope in an office at 1000 Toa Payoh North. "Several tests were conducted on the envelope by SCDF's HazMat Specialists and no harmful substances were detected," the statement said. The office where the envelope was opened and nearby areas were decontaminated as a precautionary measure. The three staff members who had come into contact with the envelope were assessed by an SCDF paramedic and were found to be well. They were instructed to shower and change their clothing as a precautionary measure. At 7pm, the SCDF gave the all-clear. The envelope and its contents have been handed over to the police. The police told Stomp they have classified this case as intentionally causing alarm, and are looking into the matter.